This dark forest road made me think of a scene out of the novel I'm working on, last week's chapter in fact. 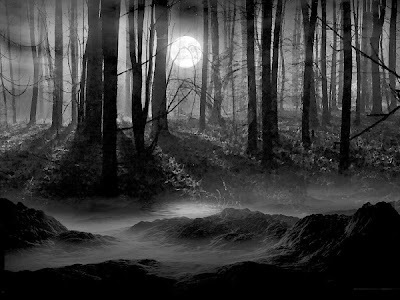 The mist and darkness evokes an ominous feeling making one wonder if something terrible is waiting just behind the trees. This is the turning point where something happens that takes my main character down a path she cannot turn back on. I'm closing in on 39,000 words which is exactly where I want to be. At this rate I should easily reach my goal of 40K total by the end of December! I finished reading The Hunger Games and I'm really glad I gave in to my friends recommendations and finally read it. I quickly overcame my initial reservations about it being written in present tense because it was done so well that I hardly noticed it after a while. It is easily one of the best books I've read this year. It passed the 'would I read the sequel test?' I absolutely will! I received Voices Of Dragons by Carrie Vaugn for the holiday and I'm eagerly starting that next. I didn't listen to much beyond Christmas music last week so my muse is hungry for new music this week! We'll have to see what I come up with. How did your writing goals fare through the holidays? Did you have to set them aside? I totally had to push my writing goals to the sidelines this holidays. My muse is feeling right ornery right about now. lol. I am reading the Hunger Games right now. I don't really know everyone's hangup about present tense. But, I am enjoying the story. Happy Holidays, Heather. Love the picture! It totally represents the the forests of Althea, which is the setting for the retelling of Beauty and the Beast that I'm working on. Although the Althean forests can be dangerous, their sinister embrace often gives Beauty the only reprieve from the unpredictable and violent temper of her Beastly husband. As for writing through the holidays... I got some done. Mostly the slow pace came from a spit of rejections I got right beforehand. I had been fully involved in a companion book to the one I'm querying (which has been getting requests for fulls) but then I got a set of blank, flat form rejections and it made me question my devotion to the companion when it's also a dystopian and the first is the same. So I fell back to Thornbriar, the Beauty and Beast retelling, which I've been working on for a while. Also mapped out a retelling of the Swan Princess. I've always let the retellings ride sidecar to other WIPs because it seemed that as someone still seeking an agent I didn't have as good a chance trying to sell a retelling. Opinions? That dark forest is a gorgeous metaphor for your protag's dark turning to the point of no return. Wow. congrats on 39K words—that is fantastic! I'm actually going to achieve my writing goal of finishing revisions by Jan. 1, I'm almost certain. Fingers crossed. Can't wait to start talking with you about our historicals, Heather. Christopher, that's a shame you had to put your writing on hold but that's often the case with the holidays. After reading The Hunger Games I know what you mean about present tense. I wouldn't let it hold me back from reading a novel now! I don't mind it at all anymore. A. Gray, I say go for it! I've come across a few agents who love retellings of fairy tales! Linda that's fantastic! Congratulations on getting so close to finishing your revisions! I can hardly wait until we can start talking historicals too! LOL, me stop writing? That's unpossible! He he he. Little Simpson's humor mixed in there. Seriously though, I'm glad you're right on track with your goals. Great pic! Golden Eagle, it was much the same with me. A nice quiet holiday left me lot's of time to write. Glad you liked the picture! Thank you so much Kari, on all counts! Wow! I'm off to check your blog and my email! I sometimes have an issue with books that are written in the present tense too! Like you said with Hunger Games (which I loved) though, when a book is just that good, you tend to forget about it! So true Natalie! I didn't even notice it after the first chapter. Voices of Dragons has a great cover. Your picture for inspiration is great. Spooky. Good job in reaching your goal. My goal was to read through, do some edits in my second novel in one week and did so. Now it's on to third novel and get some stuff edited out/in the first 80 pages, which is as far as I've gotten. Now two more weeks to work on this book. I'm hoping to get a lot done. I know Lorelei, I love the imagery of that cover. Congrats on reaching your goals! Best of luck with the rest, I'm sure you'll get there. I didn't write nearly as much as I would have liked. I am trying to do the impossible and finish a 50,000 word first draft by mid January. I'm currently just over 12,000. I am doing my own NaNo thing. I just hope I am successful. I hope to do a post about it for moral support from our wonderful community. Congrats on being able to finish your goal. Yah, Heather! That's an excellent goal Michael! Go for it, you can do it. Keep me updated on how it's going. I hate to say it, but I didn't read your post. The picture was THAT. AWESOME. Thanks!!! Oooh, creepy creepy picture! Love it. Also, it's funny you mention being a bit reluctant to read present tense. I have a few friends who absolutely HATE it. I remember it being a bit jarring when I first started reading it (mainly in my English courses during early college), but I think it's rapidly become my favorite tense to write it. I think those kinds of preferences are really interesting! There should be some sort of personality test for writers with those kinds of preferences. Congrats on your word count! It sounds like you've got a fantastic idea of where you're going with your WIP. I love those kinds of pivotal moments--those moments where you want to cackle/cry, "The plot THICKENS." Happy writing, and Happy New Year! So glad you liked The Hunger Games, and congrats on sticking to your goal and approaching 40K! Mine have been a bit nebulous--I'm revising, and don't have a set pace to work at, but I've stuck at it. Here's to success in 2011! Shayda, that would be interesting if they came up with a personality test based on what style we prefer to write in! COngrats on your VCFA residency, that's going to be awesome! Thanks Amie! You're right, revising is a bit different. But your sticking with it and making progress, that's great! Yes, I'll raise my coffee mug to success for all in 2011! Heather, I too have been listening to Christmas music. We will get back to normal soon. I love your picture. I could climb inside and hide from the world right now. Thank you for sharing it. Karlene, it's a shame the season for listening to Christmas music is so short! I look forward to it all year and hate to see it pass. I'm glad you enjoyed the picture!